There are many ways to measure the death of organized labor as a social force in the U.S. Here’s what might be the most objective one: the virtual disappearance of labor’s ultimate weapon, the strike. 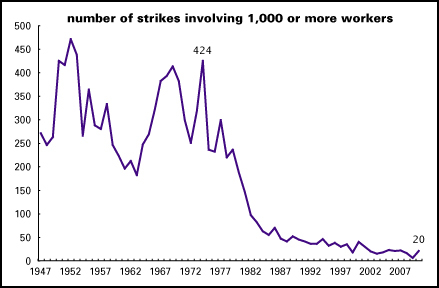 The graph above shows the annual number of major strikes, as tallied by the Bureau of Labor Statistics. (The front page for all their strike/lockout stats is here: Work Stoppages Home Page.) The figure for 2010 annualizes what we’ve experienced so far this year. The little uptick, from a total of 5 in 2009 to 20 in 2010, was boosted by a strike by 15,000 public sector construction workers in Chicago in July. Their strike produced 180,000 lost workdays last month, the highest total since 600,000 in October 2008. These numbers are nothing when compared to the peak of labor’s power, from the 1950s through the 1970s, when we saw as much as 60 million lost workdays a year, or 0.4% of the total number worked economy-wide (the record, set in 1959). Heck, it’s nothing compared even to 2000’s 20 million lost days, or 0.06% of the total. That is, they are weak because the labor movement as a whole is weak.